At the conclusion of the meeting, your reporter, who is also a property owner and tax payer of Columbia County, addressed the Board. The Observer: "I would point out that I also have a problem with, about the problem that the gentlemen [Billy Ray Franks] spoke about before. Trash is a fee for service. I hardly use that service. This has come up many times in front of the county. Commissioner Williams in a prior meeting spoke about how they used to have dumpsters and he used to throw his own trash, while he was in the construction business, in the dumpsters." Commissioner Williams yelled out from across the room: "Say what? That's a lie Lilker. I have never said I put my own trash in a dumpster. And don't you repeat that or say it anymore, or we'll go behind the barn." The Observer: "That's what you said and I'm not looking to go behind the barn right now, but if you can go, you can stand out there and come back at the end of the meeting, sir... This is not Cheyenne Wyoming, Mr. Chairman. Chairman Weaver responded: "I think you're right." Was Commissioner Williams telling the truth when he challenged your reporter to "go behind the barn?" As reported, during the November 20, 2008 County Commission meeting, Commissioner Williams denied having said he put his "[construction] trash in a dumpster" during the time that the county set out dumpsters for the collection of residential trash. Mel Roberts addressed the Board. Her remarks fell on deaf ears. hearing. During this hearing, Ms. Mel Roberts explained to the board that considering the hard economic times, both she and her tenants were having difficulty paying the high garbage assessment. 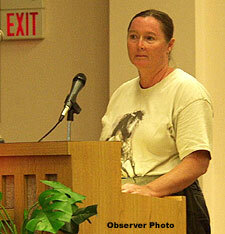 Ms. Roberts told the Board, "We live in a county where the mean family income is twenty two thousand dollars a year. I can't afford another four hundred and fifty dollars worth of taxes. That's a month's worth of groceries for me. If I have to make that choice, I can't pay the tax. Commissioner Williams lectured Ms. Roberts, telling her that she needed to add the assessment to the tenants' rent. Ms. Robert's told the Board, "They can't pay that. The tenants I have are both over thirty days in arrears on their rent. The one woman has taken a second job and they are stilling falling behind. These people don't have that money. They don't have an extra two hundred and forty dollars to pay in rent. They can't absorb that cost, neither can I." After some more conversation Commissioner Williams suggested that Ms. Roberts "get out of the rental business." Ms. Roberts told the Board: "I am sure I am not the only person in Columbia County that feels like this. It's more than they [the tenants] can afford. I realize that all services have to be paid for. There comes a point where you have to make allowance for people's economic situation… If you can't reduce the rate, just cut the service... The way they used to have it with the dumpsters, that was really inexpensive for the citizens of the county. 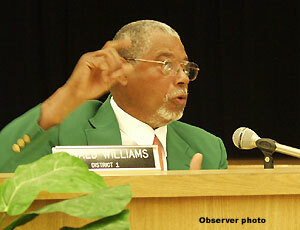 Commissioner Williams said: ".... I'm a contractor, so when I say contractors, I'm including myself..."
Commissioner Williams said: "No, it was abused to [by] the citizens of the county, because everybody would be ripped off for doing so. We was getting garbage out of county, from contractors, and I'm a contractor, so when I say contractors, I'm including myself..."
An Observer point of interest. The September 4th special assessment public hearings had to be canceled because the Board, the County Manager and the County Attorney all forgot that the hearings were scheduled during the regularly scheduled Board meeting that evening . The County spent over seventeen hundred dollars advertising these hearings with full page display ads in the Lake City Reporter. After Ms. Mel Roberts made the Board aware that the special assessment public hearings were scheduled for the evening’s meeting, it was clear that the Board and the County Manager had dropped the ball. Chairman Weaver turned Mr. Feagle down, necessitating the emergency special meeting on September 11th and the inconveniencing of the public and the county staff and a bunch of hollow excuses.